Longer coverage periods with other benefits available through Suzuki Extended Protection (SEP). The V-Strom’s Anti-lock Brake System (ABS)** has Suzuki’s unique Motion Track Anti-lock and Combination Brake System. This system aids rider control during sudden braking, even in corners, and will help the rider continue cornering on the originally intended line. • This advanced ABS system adjusts brake pressure during upright riding with other pressure adjustments when the motorcycle is leaning to either side, so the stopping force matches the available traction. • Information about the motorcycle’s attitude is continually measured by a Bosch five-axis IMU. Sensors on the front and rear wheels continually measure speed. The wheel speed and IMU measurements, plus the amount of brake lever or pedal pressure, are calculated by the ABS control unit to instantly adjust the fluid pressure to the brake calipers as required. • Additionally, this combination system can apply rear brake pressure when the front brake pressure reaches a certain point to help stabilize the vehicle. This increases stability and maneuverability during cornering. • The rider has customary, independent control of the front and rear brakes unless a situation occurs to activate the anti-lock or combination braking features. • Thanks to the new, advanced ABS control unit, the amount of kickback from anti-lock function to the lever and pedal has been significantly reduced. 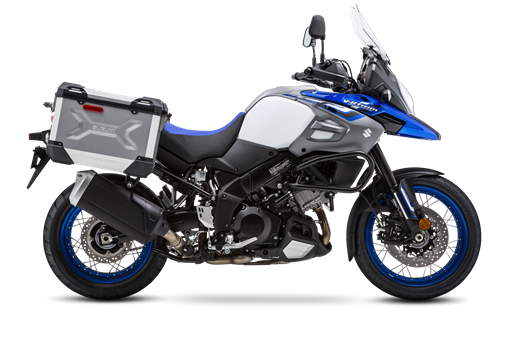 Suzuki debuted its first motorcycle Traction Control System* on the 2014 V-Strom 1000, and a new-generation system is employed on the 2019 V-Strom 1000XT Adventure. Suzuki’s Traction Control System lets the rider control the throttle with more confidence in a variety of riding conditions. • The Traction Control System continuously monitors front and rear wheel speeds, throttle opening, engine speed, and transmission gear. It quickly reduces engine output when it detects wheel spin by adjusting ignition timing and air delivery. • The rider can select one of three modes (1, 2, and OFF). Modes 1 and 2 differ in terms of sensitivity. Mode 1 has lower sensitivity; it allows a certain degree of rear wheel spin for good road conditions. Mode 2 has higher sensitivity; the system engages traction control sooner and is for poor road conditions. The 43mm KYB inverted front forks provide a sporty yet plush ride in diverse conditions. The fork legs have adjustable spring preload plus compression and rebound-damping force adjusters. A wide variety of Genuine Suzuki Accessories for V-Strom 1000XT Adventure owners are available, including top cases of different sizes, auxiliary lights, high- and low-profile seats, and a large selection of Suzuki logo apparel. Additional lock tumblers that match the bike’s ignition key are included, so you can add Suzuki accessory luggage (such as the 35L top case) and have the convenience of same-key operation. -NOTE: The supplied aluminum panniers use a different key than the motorcycle's ignition key. *The traction control system is not a substitute for the rider’s throttle control. It cannot prevent loss of traction due to excessive speed when the rider enters a turn and/or applies the brakes. Nor can it prevent the front wheel from losing grip.